Stores data from one execution or loop iteration to the next when enable? is set to TRUE. This node operates similarly to shift registers in loops. The node stores data when the loop completes an iteration and then sends the stored data to the next loop iteration. The next iteration reads the data, writes a new value to the data, and sends it through the loop again. This process continues until the loop execution completes. By default, the node stores data from only the previous execution or iteration. However, you can configure the node to store n samples of data by delaying the output of the node for multiple executions or iterations. If you increase Delay to more than one execution or iteration, the node outputs only the initial value until the delay you specify is complete. 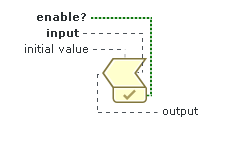 The node then begins to output the stored values in subsequent order. The number on the node represents the number of delays you specify.